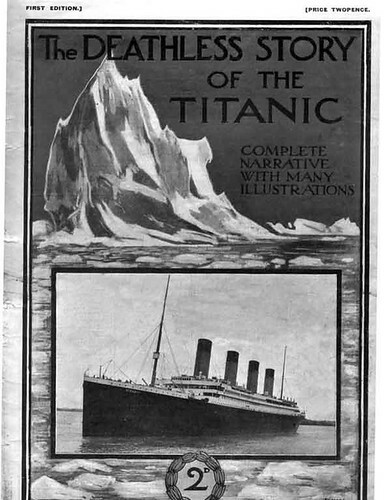 “Titanic” at that time greatest of all the world’s great ships, stands alone in its awfulness, supreme in tragedy. I have no personal family connection with anyone aboard “Titanic” on its fatal trip. But I do know once upon a time that the story our Grand Theatre and the Story of the “Titanic” in part shared the stage together I discovered this fact fifty odd years ago. The sinking of the Titanic on her maiden voyage in the early hours of April 15th 1912 was one of the greatest disasters of the 20th century. And before the doomed ship was engulfed in the devouring waters there was drama on her decks more wonderful in its dignity and splendour than any that has been invented by imagination Here a just two small stories of that drama played out in reality by a Staffordshire man and acted out on the stage by a well remembered Wolverhampton thespian. The tragedy represented, in its own right, the end of an era of arrogance and social discrimination in sea travel. 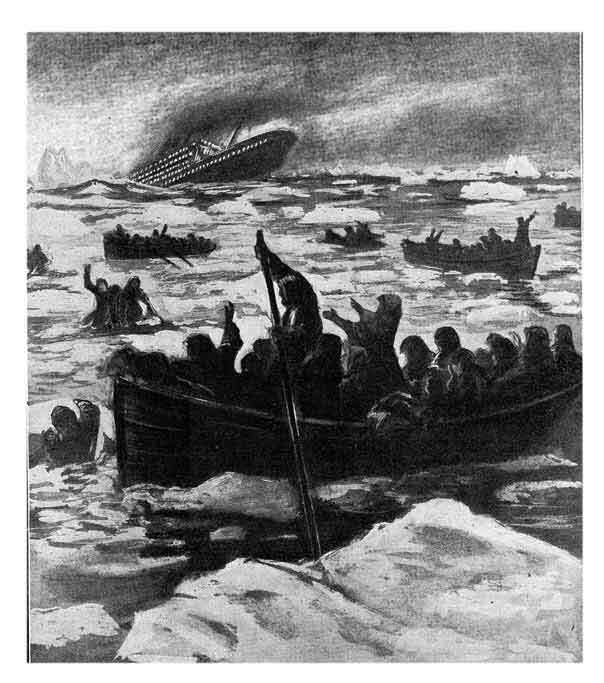 Quickly superseded by the horrors of the Great War, and further sinkings – notably of the Lusitania – interest in the Titanic waned until Walter Lord wrote his famous book “A Night to Remember” in the 1950s. This book was based on the many survivor testimonies he collected, and was made into a feature film by William MacQuitty. So how is this tragic story, now film, connected to the Grand Theatre in Wolverhampton? A total of 1,517 souls (men, women, and children) perished. went the titanic went down, Only 711 survived. This is a small portion of the list of those survivors. 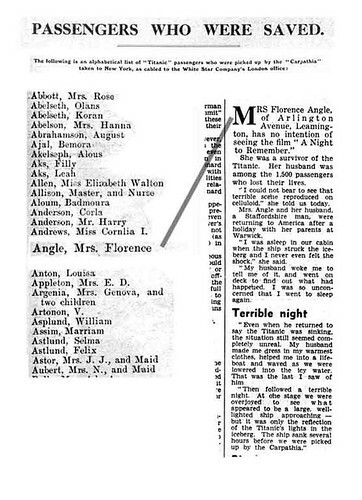 Notice it included a Mrs Florence Angle, whose husband was among the passengers who lost their lives, and nearly fifty years on; she gave this account to the local paper after being offered a grand night out to the Film premiere of A Night to Remember in 1958. ” I could not bear to see that terrible scene reproduced on the screen,” she told us today. Mrs Angle and her husband a Staffordshire man, were returning to America after a holiday with her parents at Warwick. The link to the Grand is A Night to Remember. 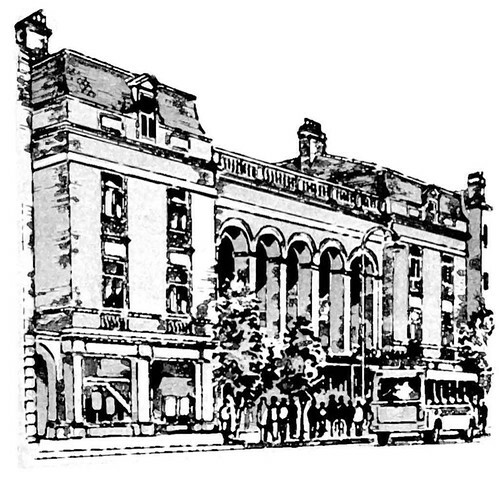 Each week during the summer season at The Grand Theatre Wolverhampton, a core company of twenty actors and crew would present a new play to packed houses. Future stars of stage and screen such as Kenneth More, Peggy Mount, June Whitfield and Leonard Rossiter honed their craft under the watchful eyes of discerning Black Country audiences. 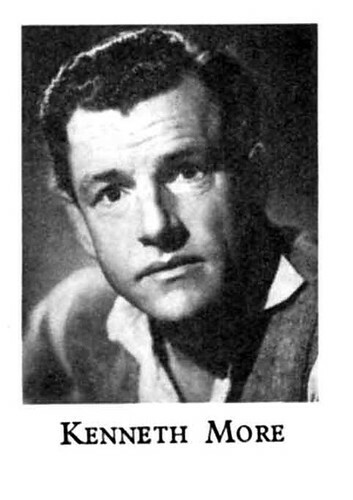 later in the 1950s actors such as these went into big stage and television adaptions many became box office film stars one of these was Kenneth More. Who amongst those brave enough to sit through “A Night to Remember” in 1958, recounting the final night of the RMS Titanic, will forget the part played with great effect by Kenneth More. The Titanic the largest vessel afloat, was widely believed to be unsinkable. Her passengers included the cream of American and British society. and story of her sinking is told from the point of view of her passengers and crew, principally second officer, Charles Lightoller played in the film by Kenneth More. In the waters of Death. A great chorus of human agony, a great and bitter cry, went wailing up to the black dome of night as 1,600 human beings or more plunged into the sea of death. The story of what followed is agonising, yet must be told, because out of its horror there shines the most heroic virtu, and the victory of death was greater than its tragedy. It has been told by those who escaped in a miraculous manner. 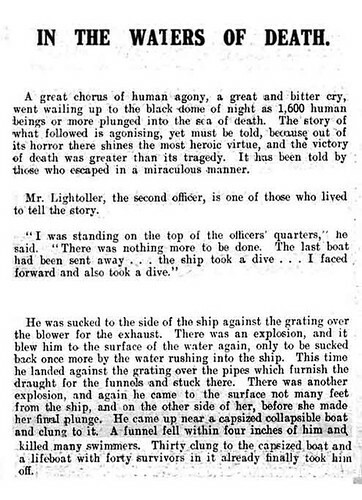 mr Lightoller, the second officer, is one of those who lived to tell the story. “I was standing on the top of the officers quarter,” he said “There was nothing more to be done. The last boat had been sent away… the ship took a dive… I faced forward and also took a dive. I was sucked to the side of the ship against the grating over the blower for the exhaust. There was an explosion, and it blew me to the surface again, only to be sucked back once more by the water rushing into the ship. This time I landed against the grating over the pipes which furnish the draught for the funnels and stuck there. There was another explosion, and I again came to the surface not many feet from the ship before she made her final plunge. I discovered I had surfaced close to a capsized collapsible boat and clung to it . A funnel fell within inches of him and killed many swimmers. Thirty clung to the capsized boat and a lifeboat with 40 survivors in it already finally took him off. The Titanic story has put a spell on our imagination Its cherished memory will forever be remembered like no other.